A global insurer was facing challenges with its local finance and accounting outsourcing partner. The service offering through the consultant was proving to be expensive and the work was being done on local accounting tools, which created additional challenges in consolidation of international accounts and reports. The client expected to reduce costs and manage risks, as well as to drive business and revenue growth. 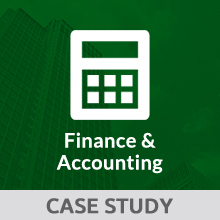 The need was to streamline the processes and to create best practices across the F&A function, including owning the general ledger accounting as well as providing an end-to-end reporting application covering both internal and external reporting. To achieve those objectives, Xceedance built an internal team comprising qualified accountants and subject-matter experts in finance with extensive experience in serving international organizations in the fields of accounting, U.S. GAAP, and regulatory reporting. Our Finance and Accounting team was committed to offer the strategic direction necessary to transform the client’s business and guide the organization towards financial success. A controlled, two-phase transition plan was agreed with the client with an expected completion time of two years. We addressed client requirements by successfully transitioning travel and entertainment expenses and accounts payable in Phase 1 in less than four months; and we transitioned general ledger accounting, balance sheet reconciliations, U.S. GAAP, and statutory and regulatory reporting for regional requirements in Phase 2 in less than seven months – without impeding the quarter-end deliverables. We successfully utilized SunGard ERP by customizing the client’s specific accounting and reporting requirements, with proprietary ownership resting with the client. An MS Access database was built to assist the client in producing premium earning calculations. In partnership with the client, we customized travel and entertainment expense reporting. Existing processes were streamlined, simplified, and automated, establishing benchmarks to ensure better governance and regulatory compliance. We ensured the data reported was accurate and consistently presented on a monthly basis, helping the client to shape the financial success of the organization. Detailed process documentation/manuals and learning guidelines were put in place in real time. At last report, the client had realized a 52 percent reduction in its F&A costs. We have built a very strong relationship with the Xceedance team. They understand very specific and nuanced reporting requirements. We can now bring back in-house much of the work that was being undertaken by the existing service provider. The Xceedance Finance team is really the backbone of our overall finance function.